LAS CRUCES - The New Mexico State football team opens its 2014 fall camp, Friday, Aug. 1, at the football practice field beginning at 3:00 p.m. Practices will be open for the first 45 minutes of practice then closed for the remainder of practice. The first five days of camp are the NCAA mandated five-day acclimation period before the Aggies jump right into two-a-day practices on Aug. 9. The Aggies' annual media day in Las Cruces is scheduled for July 31 at 10:30 a.m., in the football meeting rooms, located on the north end of the stadium. 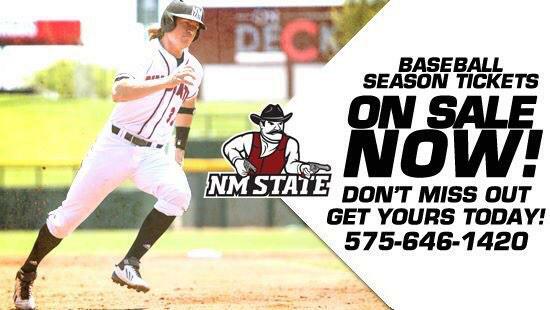 NM State opens up its 2014 season, Aug. 28, against Cal Poly inside Aggie Memorial Stadium. Kickoff is set for 6 p.m. Season tickets are available now and start at only $50, while kids 12 and under are just $5 a game. Tickets can be purchased through the Pan American Center ticket office, by calling 575-646-1420, or visiting Ticketmaster.com and searching for NM State football. The Ticketmaster website now allows Aggie fans to pick their specific seats directly from their computer. Aug. 1 – 3 p.m.
Aug. 2 – 3 p.m.
Aug. 3 – 3 p.m.
Aug. 4 – 3 p.m.
Aug. 5 – 3 p.m.
Aug. 7 – 3 p.m.
Aug. 8 – 3 p.m.
Aug. 9 – 9 a.m.
Aug. 12 – 3 p.m.
Aug. 14 – 9 a.m.
Aug. 15 – 3 p.m.
Aug. 16 – 3 p.m.
Aug. 18 – 3 p.m.
Aug. 19 – 3 p.m.
Aug. 20 – 3 p.m.
Aug. 22 – 3:30 p.m.
Aug. 24 – 3:30 p.m.
Aug. 25 – 3:30 p.m.
Aug. 26 – 3:30 p.m.
Aug. 27 – 3:30 p.m.